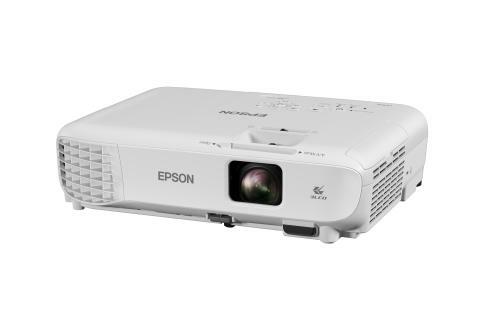 Epson has launched the new multi-functional EB-05/40 series of business projectors that come packed with features, bringing true-to-life images to presentations in meetings and classrooms. The projector series include EB-S05, EB-X05, EB-W05, EB-S41, EB-X41, EB-W41 and EB-U41. The EB-05/40 series of projectors deliver crystal clear images of up to 3,600 lumens of colour and white brightness, and a contrast ratio of 15,000:1 for a dynamic viewing experience regardless of ambient light. The projectors have a long lamp life of 10,000 hours in eco mode, reducing maintenance and bringing cost savings. The home screen of the EB-05/40 projector series displays frequently used functions for immediate access, source information and wireless connections in a single screen. An intelligently positioned front-facing exhaust directs the heat away from surrounding audience when placed on a table. An easy-to-use horizontal keystone adjuster enables skewed screen images to be automatically corrected quickly and accurately. The split screen function for side-by-side viewing of two screens enables presentation materials and the presenter to be shown simultaneously during video conferencing. The projectors come with advanced connectivity, supporting a range of connectivity options, including HDMI, VGA and USB. Users can project Full HD content wirelessly through screen mirroring from compatible smart devices without any software installation with Miracast for easy set up. The EB-U42 is equipped with two HDMI ports, one of which is MHL-enabled for greater digital compatibility.